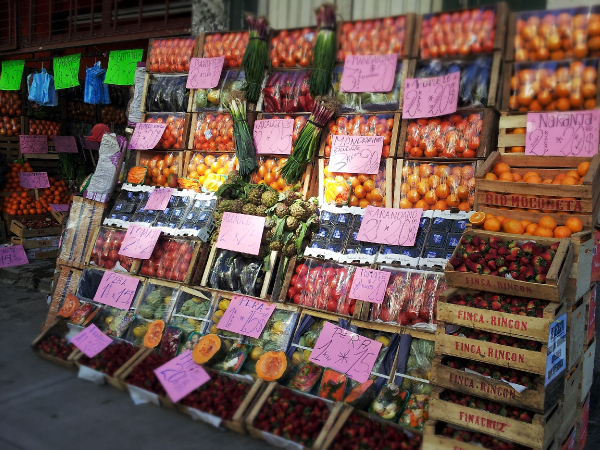 Katy, the registered dietitian behind Have Fruit Will Travel, emailed me about a guest post – from South America! She is in the middle of a year-long globe trotting adventure with her husband. We agreed the ideal topic for Katy would be to write about how she is finding healthy food to eat across the world. 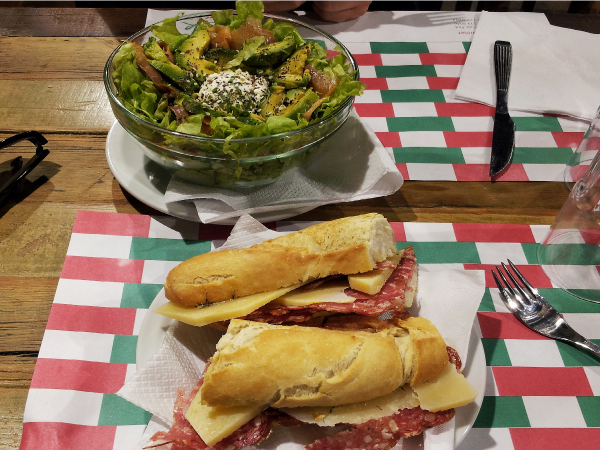 Vacation pounds can settle in fast, and since travel is her lifestyle at the moment Katy gives some good tips on eating well abroad. In June of 2014 my fiancé, Nick, and I quit our jobs to travel around the world for a year. We started in Costa Rica, then traveled south to Panama, Brazil and Uruguay and are currently in Buenos Aires, Argentina. Next we are off to Europe and Asia. Since the inception of this plan, the foodie in me has been drooling at the thought of getting to try food from all over the world, I truly believe you cannot experience a culture without experiencing their foods. As a dietitian though, I was a little concerned: how were we going to make sure we were getting the nutrients we needed and avoid giving into the “free for all” mindset that comes with vacations? After all, this isn’t so much a vacation, it’s a whole year and neither our wallets nor our bodies would thank us for engaging in that kind of eating. Not to mention, a healthy diet is just as important while traveling; it helps to keep your immune system strong (think of all the germs on an airplane or subway), helps prevent your digestive system from getting too out of whack and I just tend to feel better when I eat healthier. Fortunately, we have been able to find a balance. I keep the dietitian in me happy by making sure we are getting enough of the good (fruits, vegetable, fiber and protein) while still enjoying the occasional indulgence. Filling up on the good has helped ensure that we don’t go overboard with the indulgences. We try not to splurge at the expense of healthy foods and no matter what we try to make sure we get enough fruits and vegetables; even if some nights that just means adding extra veggies to a pizza. It has only been too easy to keep the foodie in me happy. We have really enjoyed trying the local specialties that bring out the best of each area. 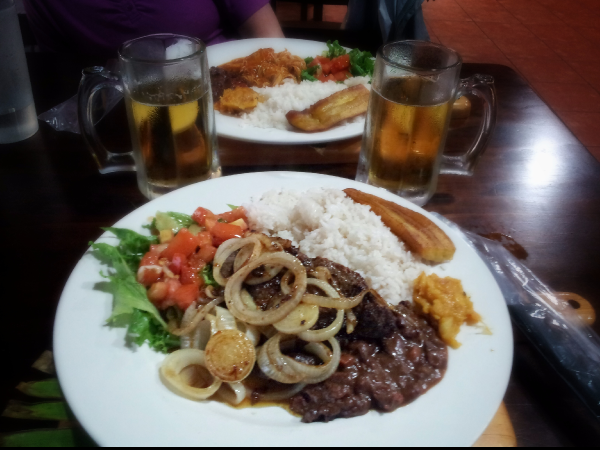 In Costa Rica we ate lots of rice and bean based dishes full of veggies. In Bocas del Toro, Panama, there was tons of fresh fish and almost every restaurant had their own mouthwatering ceviche. 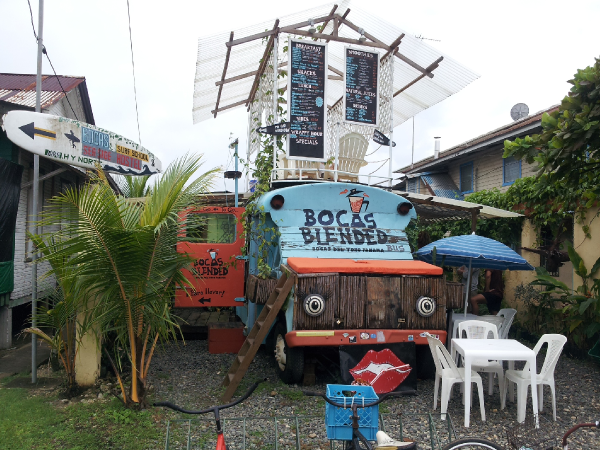 Brazil made the most of their abundant fruit with acai berries and fruit smoothie stands galore. Here in Buenos Aires it is all about beef, wine and Puerto Cerrados. A Puerto Cerrado, or closed door restaurant, is basically foodie heaven. Chefs open their homes as tiny restaurants, the locations kept top secret until the reservation is confirmed. There are no menus; instead dinner is several courses, paired with wine, of whatever the chef has lovingly created. We absolutely couldn’t pass that up. So we went, savored every delicious calorie, and cut back elsewhere, opting for lighter foods the next couple of days. Fortunately we are currently staying in an apartment with a kitchen. We have alternated between renting apartments in cities where we have stayed longer and hotels for shorter stays. Here in Buenos Aires we have a hotplate and a microwave- it’s not much but with a little creativity we have been able to come up with some killer, veggie packed dishes. We always try to have cooked beans and grains on hand, as they are cheap, high in protein and fiber and so easy to throw together for a quick salad or stir-fry. We cook at “home” for at least two of our three meals. When we do go out I keep my dietitian side happy by splitting meals. Splitting meals is not only a cheaper option (so important to us right now) but it means automatic portion control and we both feel satisfied, not stuffed. When we order two meals we both end up eating too much because we feel obligated to finish our meals. We never know when we will be home and don’t want to carry a box around with us for hours. The best thing we have learned is to always, always have healthy snacks with us everywhere we go. Thanks to all the hiking, sightseeing and exploring cities we spend a lot of time away from home, sometimes longer than we anticipate, and have found snacks to be a life saver. When either of us gets hungry, things go downhill fast. Ever heard the term “hangry?” It is only a slight exaggeration to say healthy snacks have saved our relationship. Eating a quick bite to avoid becoming ravenous also helps reduce the allure that sugar and calorie bombs like bakery treats or gelato always seem to have when I get hungry. We have enjoyed our travels so far and look forward to whatever food and adventures are next. One thing is for sure, we will face it with plenty of healthy snacks and vegetables! 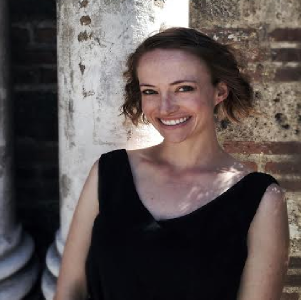 Katy Bloxsom, RD, quit her job as a corporate dietitian to travel the world in 2014. However, she will always be a dietitian and is passionate about education and healthy eating no matter where she is or what she is doing. She wants to prove healthy can also be delicious. The world is full of healthy and delicious foods and she enjoys introducing people to healthy eating through novel and interesting foods. She approaches healthy eating with the attitude that all foods can be part of a healthy lifestyle- in moderation. She believes everyone can live healthier by making small, sustainable changes and focusing on healthy food choices. Great healthy eating tips to keep in mind when I travel next! You should do a Q and A interview next time you feature a guest! 🙂 I like reading those. Just checked out her blog. Love it! Especially the melon bowls on the most recent post. Thanks for sharing. Thanks Tonya! They were a lot of fun to make and so tasty! What adventures you’re having. Love the photos! It’s taken me a while to come to terms with food-splitting, but it sure saves money and calories. I’m not sure I can relate to this post…I can’t say I find myself on vacation often enough (or long enough!) to have to worry about nutrition. It must be nice to be able to take vacations often enough to have to be concerned about what you’re eating. That being said, I usually just let myself eat whatever looks good or is a specialty in the area I’m in. I try to stick with healthy breakfasts (unless the breakfast location is a destination!) and then I don’t worry about the rest of the day. This is such a great post! I too took a year to backpack around the world, and know the importance of budgeting both money and calories 😉 I’ll keep these tips in mind for my future travels as well! I love hearing that other people have done this too! It can be difficult to figure out the money and diet but it is a good challenge to have! Great tips! When I’m on vacation (or traveling), I tend to eat a larger breakfast with maybe a snack in between to hold me until dinner, which I usually eat earlier than usual. I love filling up at breakfast because there are so many tasty, healthy options most places you go, and it’s usually the cheaper meal, too. 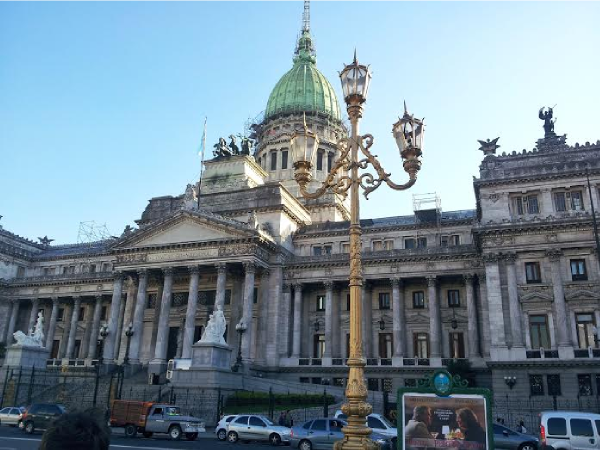 I lived in BA for a year and a half as an expat with my husband. And my daughter was born there. It holds an incredibly special place in my heart. Favorite restaurant. Osaka (best ceviche ever!) and best medialunas ever! Domani on Salguero in Palermo Chico (right across from Starbucks). She did an awesome job of documenting her reviews of their experiences while living there. I wish I would have seen that blog when I was in BA! There are so many intriguing restaurants there that a guide is almost a must. Great food city! Such a cool story and what an amazing experience! These tips are excellent for any type of travel, but also work well for day-to-day life as well. Everything is all about balance. Thanks Dana! Balance is key! This was a fun read! We haven’t done a couples’ trip in a while, but our family road trip rules are things like “don’t fuel our bodies where we fuel the car”, “grocery stores over restaurants most of the time” and “stick with water, not juice or pop”. Now that I think of it, I’m pretty sure the last trip my husband and I took alone (that involved actual travel, not just a long car ride), the rule was “EAT ALL THE DELICIOUS THINGS”. So hard to eat out and eat healthy! – but it definitely is possible. I love hearing how others make it work and could not imagine being on the go for a whole year. How exciting! Looks like you guys had a good trip! Lots of great snacks there! My boyfriend and I did a month in Costa Rica. And while it was lovely, it was definitely difficult to get away from the heaping portions of rice and beans. We did really well by eating light amounts of fruit for breakfast, and indulging in later meals. Fortunately, with the time off, most of our time was spent active, so it helped balance the surplus of calories from food. Love the post and the tips. Have fun in your travels! Costa Rica was amazing, especially all of the exotic fresh fruit! The hiking and sightseeing was great as well, it was easy to stay active!